A memoir from Ambassador Jean Kennedy Smith, the last surviving child of Joe and Rose Kennedy about growing up as part of the famous political family. One might wish that she was, well, a little more 'there' — or, perhaps, more revealing — but such is the difference between 'memoir' and 'history' ... Smith writes mostly of a time in the 1920s, 1930s and 1940s when her wealthy and political family was winning considerable renown but had not yet become the cultural superstars they would be beginning in the 1960s ... Her tales are affectionate and nostalgic, the memories a grandmother would tell the grandchildren as they leafed through a photo album ... There are useful lessons here, not just for grandchildren but for Americans as a whole, especially those who might wonder how the Kennedys so captured the popular imagination. ...she’s the only one left. That’s reason enough to dip into this graceful if gossamer book ... Jean is too proper, of course, to address her parents’ marriage in any but the most reverent terms ... Papa Kennedy decided that Rosemary should have a new and promising but radical treatment: a frontal lobotomy. Jean omits any mention of it in her narrative ... We can rue how much goes unsaid here, even about those Hyannis Port summers of the l930s and l940s. Or we can concede that the last Kennedy of her generation has the right to tell the story she wishes, and let it go at that. Slim as this volume is, it still makes for engaging reading. ...like sitting down with your great-grandmother to look at a scrapbook of old photographs taken with a Brownie camera loaded with Kodak film. A relic from a bygone era. Sweetly nostalgic ... At first, I assumed this slight book was ghostwritten but, as no other writer is named, perhaps not. Still, I agonized for whoever did the writing because the poor soul seemed to have no access to fresh material — no personal diaries, fulsome letters, or unpublished photographs ... sin[s] of omission — and there are many throughout the book — mar this memoir and keep it from being more than superficial gloss. 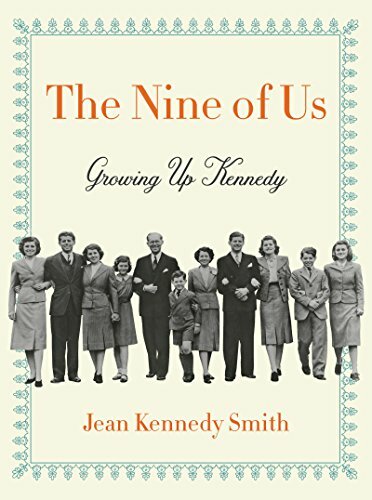 What did you think of The Nine of Us: Growing Up Kennedy?